After the other article about Knopfler’s Ernie Ball volume pedal, this time I want to feature the volume pedal he played before, which means during the Dire Straits days until the end of the Making Movies tour in 1981. 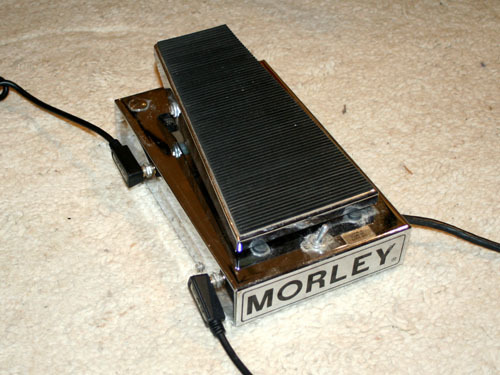 The pedal I am talking about is the silver Morley Volume Pedal. Morley made a whole range of effect foot pedals, including a very popular wha-wha or even models with built-in flanger or delay. All of these could be used as simple volume pedal as well. 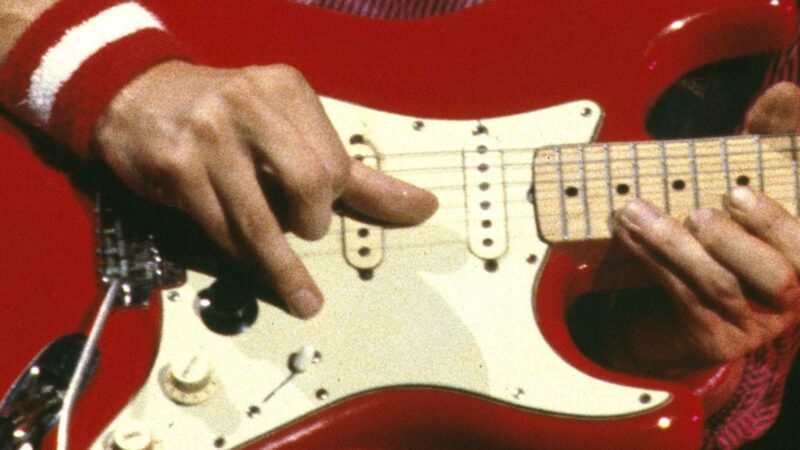 Knopfler’s model, simply called “VOL”, was just the ordinary volume pedal. As the bulb needs electric power, the pedal is powered via mains line voltage, no external 9V adaptor like modern pedals! Since the power indicator bulb is part of the circuit, it means when it blows the pedal is dead. Fortunately replacing the bulb is simple and cheap. The pedal way is extremely long. This means you can control the volume precisely, but you have to move your feet quite a lot. You get used to this, I have no problems with it. 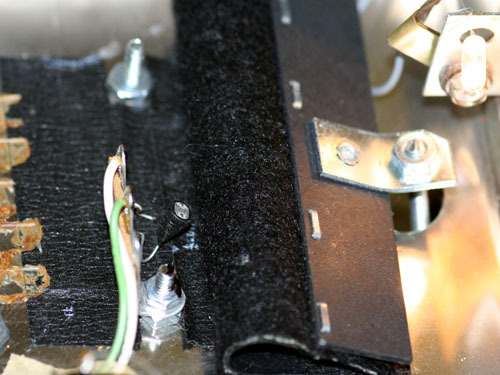 You can adjust how quickly or slowly the pedal reacts with a screw that changes the position of that black cloth. And you can adjust how easily the pedal moves with the two screws that hold the pedal. The whole thing is very stable, you can rest your foot with a lot of weight on it without problems. One thing that is remarkable is that the pedal changes the sound, even when pushed down completely (full volume). This is due to the – compared with other guitar gear – extremely low input impedance which dampens the resonance peak of any passive guitar pick-up. It sweetens the sound of a Stratocaster pick-up. Without it that Dire Straits sound would definitely have been harsher. Vintage Morley on stock in our shop ! I finally got the time this weekend to get it plugged in and well what a great pedal this is, I have an old Ernie ball so I wasn’t expecting much different and really bought this out of curiosity and the look of the thing. 1. It really has a violin affect, warm and smooth, it makes my Boss DDS-3 sound better strangely. 2. I always struggled a bit with the solo in Lions (first note or two with the bridge pu) as it was too harsh a sound, this gets that wonderful horn sound with a beautiful transition as the volume is raised. 4. When you hear this it’s only then you appreciated what is on the record, it’s fantastic when used at the end of a string bend too, really soulful. It was your site back in the day that made think about getting a Morley, and then got side tracked with an Ernie ball and now you supplied one. Sorry for the lot of questions, keep up the great site and keep on pickin’! I´m interested in the pedal that you have, I live in Spain. Mail me, to send me all the details. Congratulations for your site. it´s great. If you have any of your Morley Volume pedals left for sale I would be very interested – please let me know. yes, I have. Please use the contact form of this site (under ‘Pages’) again, and I will reply via email then to tell you the details. Having had a chance now to play with the pedal I would just echo Dermots analysis – a very smooth precise transition cen be achieved and it sounds great. The long pedal throw is easy to adjust to also. Thoroughly recommended. I have enjoyed the information on knopfler. I find the tone on sultans to be a holy grail of sorts -not unlike many people. I heard Muff Winwood used an aural exciter on the first album and bought one myself. I know they make a foot pedal now as well. Have you ever used one? I recently purchased some bare knuckle pickups that I’ll be putting into my 50’s strat reissue. I’ll let you know how they sound if you’re interested. I take it that live in Germany. I live in California and teach history at a local school. You have a place to stay if you ever want to come and visit. the info about the Aphex Exciter on album one is not really confirmed. I have never tried the floor version myself, but I think Dermot has it. I heard some good things about the bare knuckle PUs but have not tried them either. if you have any pedal left please let me know, it will be with shipping to France. Your site is a well of information, Congratulations!!! I’ve been looking for the Knopfler Morley volume pedal for a long time and would very much like to purchase one from you if you have any left! I’m a professional guitarist and live in Ireland. Like Karl said above, if you ever come to Ireland, you’re more than welcome to come stay, play and talk all things music. By the way; your site’s great and thanks for all the hard work you put into it. I’m sure it’s much appreciated by many people. Unfortunately I don’t have any Morley left for sale at the moment. Really appreciate your site, the information is very useful. Could you describe how to measure this value, and what the value is for Knopflers pedal? I have a couple these pedals, one of which I want to restore, and I’d be interested to find out where they are in terms of this.